It has been a little while since I posted about professional reading here. 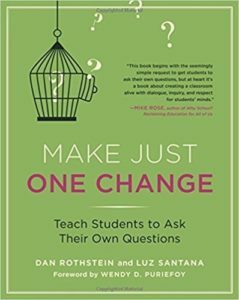 I picked up Make Just One Change: Teach Students to Ask Their Own Questions by Dan Rothstein and Luz Santana at the suggestion of colleagues at my school. This is one of those books, sort of like Understanding by Design, that makes such a clear, compelling case in such an immediate way that you wonder how you’ve been teaching all your life without using the techniques the authors describe. You can quite literally take the Question Focus Technique (QFT) described in this book right into your classroom. Rothstein and Santana argue that students learn better, retain more, and are more engaged if they are trained to ask questions. The way teachers can facilitate this learning is to give students a prompt, which the authors call a “QFocus” or “Question Focus.” I decided to try this out in my short Emily Dickinson unit in AP Literature. You have to wrestle with word choice. I ultimately decided on “word choices matter” as the QFocus that would best help generate questions about word choice without being too obtuse or unnecessarily provocative. Ask as many questions as you can. Do not stop to discuss, judge, or answer any question. Write down every question exactly as it is stated. Then I asked the entire class to share our their question ideas rather than generate ideas in groups. It might seem easy, but it is really hard not to try to rephrase questions, and it is also hard not to place a value on the question through encouraging students who ask good ones. If you comment on the value of a question, you are liable to shut down students who think maybe their questions are not as good. And you do need to remind students of the rules. They wanted to dismiss some of the questions. I should back up and add before we generated questions, we discussed the rules and in particular which ones would be hard to follow. Rule 2 was the one they knew (rightly) they would struggle most with because they love to discuss ideas. Why is it word choice matters instead of word choices matter? Isn’t it ironic that word choices matter in a statement about word choices? Why are we doing this exercise? Is this supposed to be about The Hours? In what context is word choices being applied? Is this about Emily Dickinson? Are we still going to see her house? And get lunch? Do word choices always matter? Do authors limit themselves to their own writing style? Do authors limit readers to their (reader’s) interpretation? In what scenarios does word choice matter the most? Is word choice very important to all authors or just some? Do authors disagree about the purpose of word choice? Are we implying that the effect of words are quantified by how they compare to one another? Does word choice limit emotion? How do authors use word choice to enhance their writing style? As you can see, some of their first questions revolved around the purpose of creating questions, but they quickly generated an impressive list. The next day, I asked students to get in groups and do three things: 1) classify questions as either open-ended or closed-ended (this is an activity described in the book); 2) rewrite an open-ended question so it was closed-ended and vice versa; and 3) prioritize their top three questions. Why is it word choices matter instead of word choice matters? In what context is “word choices” being applied? The project students are completing in this unit is to create a video or presentation in which students explain one of Dickinson’s poems and explore her word choice variants. I asked them to choose one or more questions from this list as part of their project’s focus. One immediate observation: All of the students were more engaged, but in particular, some students who rarely participate were participating, and not just in the question generation. They continued to participate when discussing one of Emily Dickinson’s poems, which is an activity we did after generating questions. As I did with my AP Literature class, I brainstormed potential QFocus ideas and also considered positives and negatives for each. social groups judge each other based on difference specific might be too specific? we all use stereotypes sets up challenge to thinker negative response? argue back? I was initially inclined to select the last one, but I showed my list to a colleague, and he suggested, “stereotypes are incomplete.” He argued I said myself that it “makes me wonder,” and that perhaps part of my concern about the statement being difficult to parse is what makes it good. The students will have to pick it apart. And it has the advantage of being a direct quote from Adichie’s TED Talk. Something I actually wrote in the margins of my book on page 7, “Wonder if Parkland teachers use QFT.” It would explain the students’ activism and leadership. This post is the fourth and final in a series about my experiences at the NEH summer program, Emily Dickinson: Person, Poetry, and Place. If you haven’t read the first three, you can find them here, here and here. My experiences on the fourth day may differ slightly from those of other participants as we divided into groups. Because the fifth day was a short day, this post will include my reflections for both the fourth and fifth day of the workshop. As was the case on the previous days, we began with Bruce Penniman’s “Writing into the Day” reflections. On Thursday, we wrote in response to “What is ‘Paradise'” (Franklin 241) and our inferences about Emily Dickinson’s Amherst as she lived it. On Friday, we wrote reflections for the week in response to our choice of two poems, Franklin 930 or 1597. After writing, my group headed to the Jones Library, Amherst’s public library, to work with artifacts in the special collection. My curriculum mentor Wendy Kohler was one of our guides for this activity. 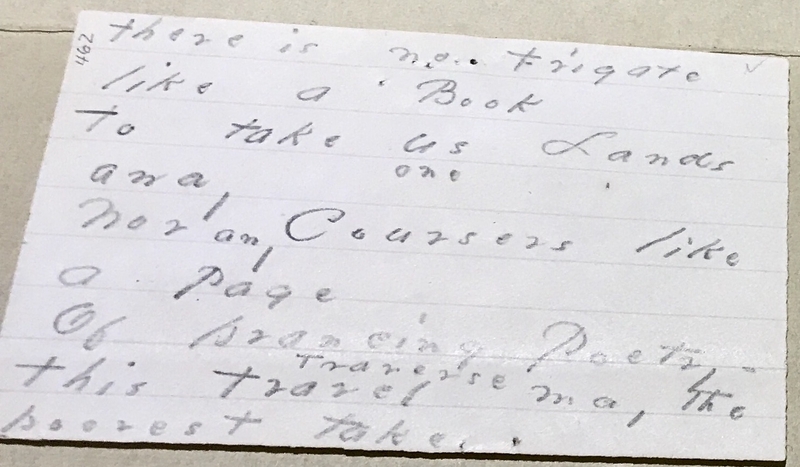 I chose to examine artifacts connected to Amherst’s history of education, as I was intrigued the previous day by Emily Dickinson’s writing instruction. 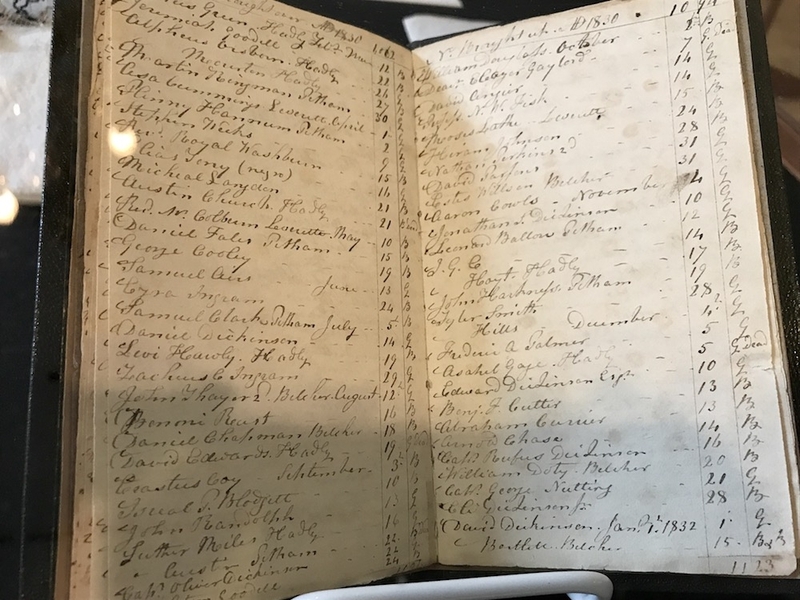 My group examined an 1822 autograph book belonging to a girl, and we were struck that her classmates wrote so frequently on weighty issues such as death and often wrote poetry. It’s a long way from “have a great summer.” There was a great deal of material connected to Mt. Pleasant Classical Institution, which no longer exists. I couldn’t find any evidence any of the Dickinsons attended the school, but Henry Ward Beecher and one of the Roosevelts, James Roosevelt, attended the school. I didn’t find a lot of answers, and I am still curious about the kind of writing instruction students were given. If you read Dickinson’s letters, you can see improvement in her expression and clarity of thought in the letters she writes during her adolescence. Clearly, Amherst citizens valued education and took great pains to make sure good schools were available to their children. I would also have had the option to explore science and religion, the Civil War, or gender/women. There was one other option that I have forgotten—my fault for not writing it down. I wish in some ways I had chosen to explore the artifacts connected to either the Civil War or gender, but we only had so much time. I might be able to go back and see these artifacts in more detail some other time. The library also has an exhibit on Robert Frost and Emily Dickinson, including several interesting Dickinson family artifacts. 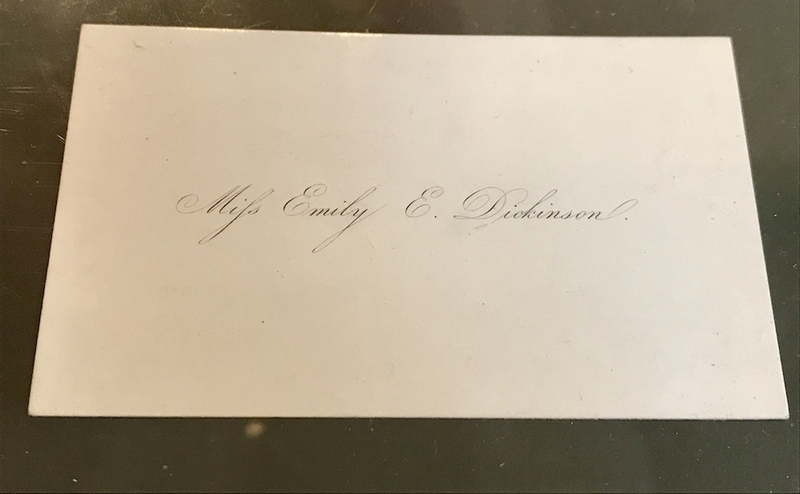 Emily Dickinson didn’t sign her first letter to Thomas Wentworth Higginson but slipped one of her calling cards inside. I like to think it was from the same batch of cards as the one above. If you look closely at this notebook, you’ll see Emily Dickinson’s birth recorded on December 10 under her father’s name. Next, my group joined Christanne Miller for a discussion of Emily Dickinson’s Civil War poetry. Miller encouraged us to select the poems we wanted to discuss. The Civil War was Dickinson’s most prolific period, and it was also during this time that Dickinson spent almost a year in Cambridge recovering from a problem with her eyes. We discussed how the death of Amherst native Frazar Stearns at the Battle of New Bern affected Dickinson and her family. Of course, Thomas Wentworth Higginson was in command of the 1st Carolina Volunteers, the first black regiment. Dickinson’s brother Austin was drafted in 1864, but he paid for a substitute to go in his stead. There is a family story my grandmother used to tell me about having an uncle (probably a great- or even great-great-uncle) who went to war as a paid substitute several times. I need to do a little research and find out if such an individual existed. She did have at least one great-grandfather who fought in the Civil War but not as a paid substitute. Basically, there were three reasons why someone might not serve in the war after being drafted: 1) they had enough money not to (Austin Dickinson), 2) they were the sole financial support of an extended family, or 3) they offered crucial community support (one could argue this also applied to Austin Dickinson). We can’t say for sure why Austin didn’t go, but we did discuss there was less support in general as the war dragged on. Miller pointed out the Civil War was the first war with a quick communication of the events of the war and with a highly literate, informed population. She remarked that one can find Civil War letters all over the country because so many people were writing during the war. Near the end of our discussion, I shared the following passage from The Catcher in the Rye with my group. It’s a passage I often like to discuss when I teach the novel. I remember Allie once asked [D. B.] wasn’t it sort of good that he was in the war because he was a writer and it gave him a lot to write about and all. 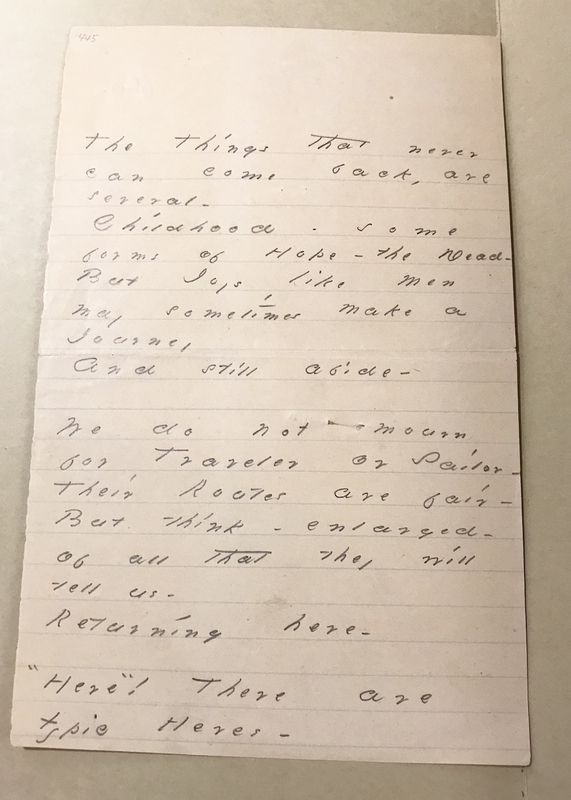 He made Allie go get his baseball mitt [with Allie’s favorite poems written in green ink] and then he asked him who was the best war poet, Rupert Brooke or Emily Dickinson. Allie said Emily Dickinson. That passage always struck me, but the experience I had this week has convinced me that Salinger was thinking on a very deep level about personal experience and writing. We don’t think of Emily Dickinson as a war poet, but she really was, and she wrote quite a number of poems that are definitely about the war and more that might be about the war, depending on interpretation. It was such a pleasure to be able to discuss poems with Miller, and if you don’t own a copy of her edition of Dickinson’s poems, definitely get it. After lunch, we spent some time working in our curriculum groups, as our lessons or units were due by 6:00 PM. Our group was in favor of working quietly. I had about an hour before the next agenda item on our schedule, so I headed to the Frost Library on Amherst College campus to work on my lesson. I needed to consult a copy of the Variorum Edition, as my lesson deals with word choice, tone, and mood, and I wanted to compile a list of poems with variant word choices. I didn’t finish the work. In fact, I only made it through the first volume (there are three volumes in the Variorum Edition). None of my nearby Worcester libraries, including the college ones, seems to have the Variorum Edition, and I was ready to consider a pretty hefty purchase (the Variorium costs over $130), when I checked to see if I could get it through our library system, which offers free inter-library loan among all the system libraries. I was lucky. Some of the other libraries in my public library’s system have the Variorum, so I have placed a hold on it, and last I checked, it was in transit to my public library. I always forget about this great service offered by my library system. If I were a Dickinson scholar and likely to consult the Variorum regularly, I would definitely purchase it, but it’s a bit steep for creating a single unit. The Emily Dickinson Museum typically does not allow photography as it’s too hard to control people making a profit from the photographs they take. We were offered the opportunity as NEH scholars to take photographs in the museum as long as we didn’t intend to profit from them. We were given permission to post the pictures on social media or blogs. 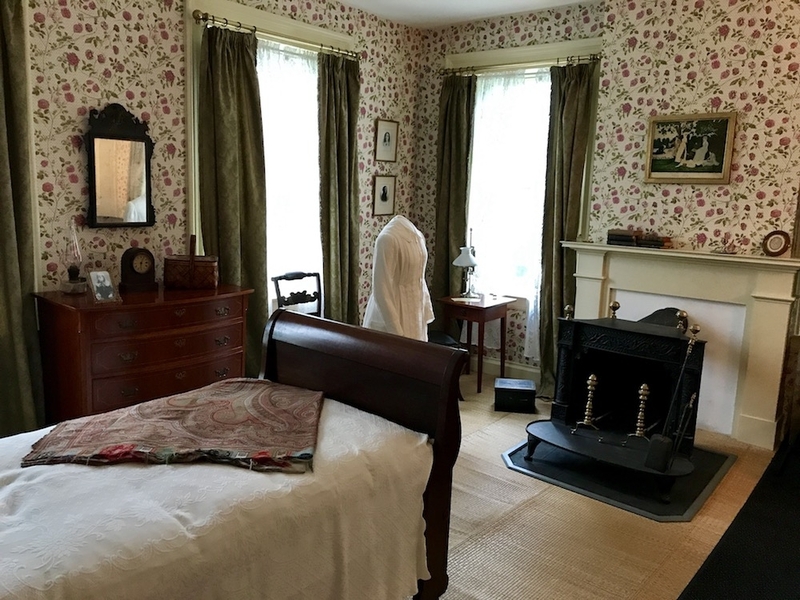 I was really looking forward to taking photos as Emily Dickinson’s bedroom, in particular, is a really magical place, especially since the recent restoration. I have been sharing a few of the photographs from the museum in previous posts, but here a few of my favorites that I haven’t shared yet. The writing table in the corner is a replica of Dickinson’s actual table, which is at Houghton Library at Harvard. The dress is also a replica. Emily Dickinson’s actual bed. The shawl belonged either to Emily Dickinson or her mother. 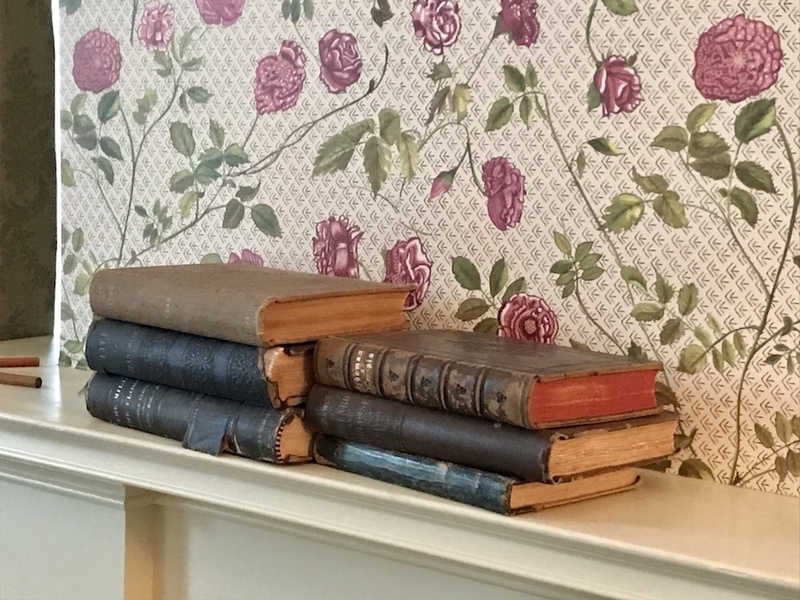 Emily Dickinson kept a few favorite books in her room. I can’t tell what the titles are, but I’m going to do some research and find out. These are probably not her actual books but rather the same editions. The Dickinsons’ library is at the Houghton Library at Harvard. 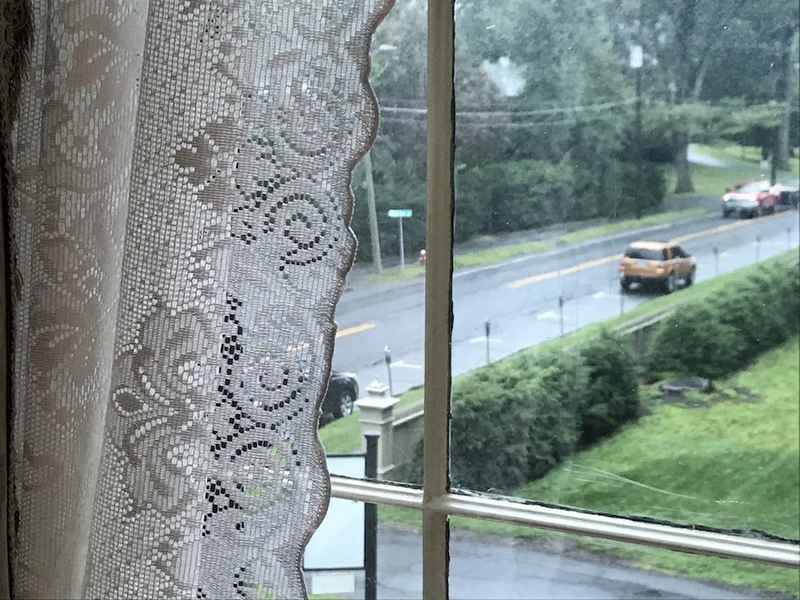 A view of Mains St. from one of Emily Dickinson’s bedroom windows. I spent some time reflecting on the incredible week over a cup of coffee downtown. One worry I expressed in my reflection is that the future of the NEH is precarious, and it’s possible that other educators will not experience the wonderful close study of Emily Dickinson in Amherst like I was able to do. Do what you can to make your feelings about programs like this clear to your representatives in Congress, especially if this series of posts has made you want to go, but even if it hasn’t because we should be helping teachers have these experiences. Trust me my NEH stipend didn’t cover all my expenses, but it made it possible for me to go, for sure. Thursday evening, some of us attended an optional program called Dickinsons in Love in which we were able to participate in readings from Dickinson family letters, including those of her parents Edward Dickinson and Emily Norcross when they were courting, Austin’s letters to Susan Gilbert before their marriage as well as letters to his mistress Mabel Loomis Todd, and Dickinson’s own letters to Judge Otis Phillips Lord. I hope the Dickinson Museum will revive this program for regular guests, as it was most entertaining, and I learned a great deal. Our final day was a shorter day, and the main event was visiting Emily Dickinson’s grave and reading our favorite poems. I shared the poem I read at my grandmother’s funeral. I was much more moved than I expected to be when one of my fellow workshop participants led us in singing one of Dickinson’s poems to “Amazing Grace.” Because Dickinson wrote in ballad meter, many of her poems can be sung to songs written in that common meter, and “Amazing Grace” is one of them. 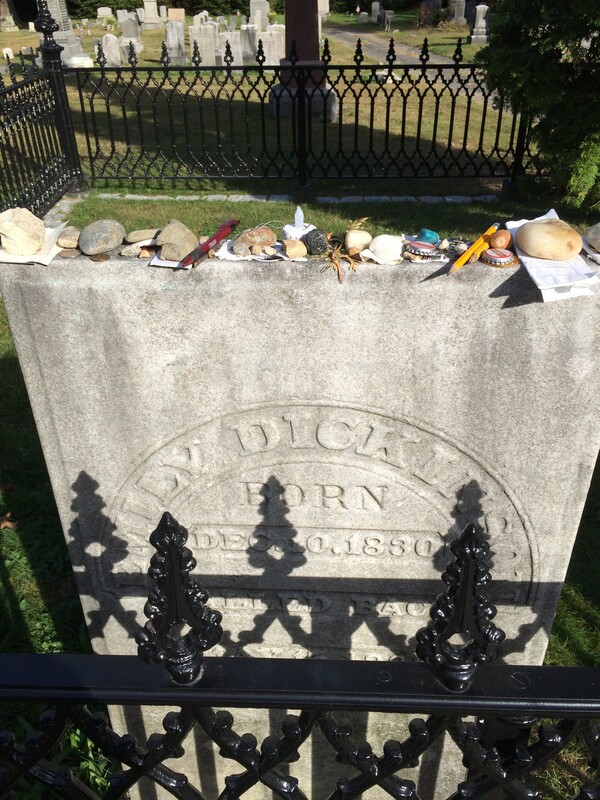 Emily Dickinson’s grave. I left the flat stone on the far left to mark my visit. We concluded our workshop with a picnic on the lawn at the Dickinson Homestead, complete with gingerbread, for which Emily Dickinson was famous. I bought a small Dickinson recipe book in the museum gift shop and tried out Emily Dickinson’s gingerbread recipe this morning. 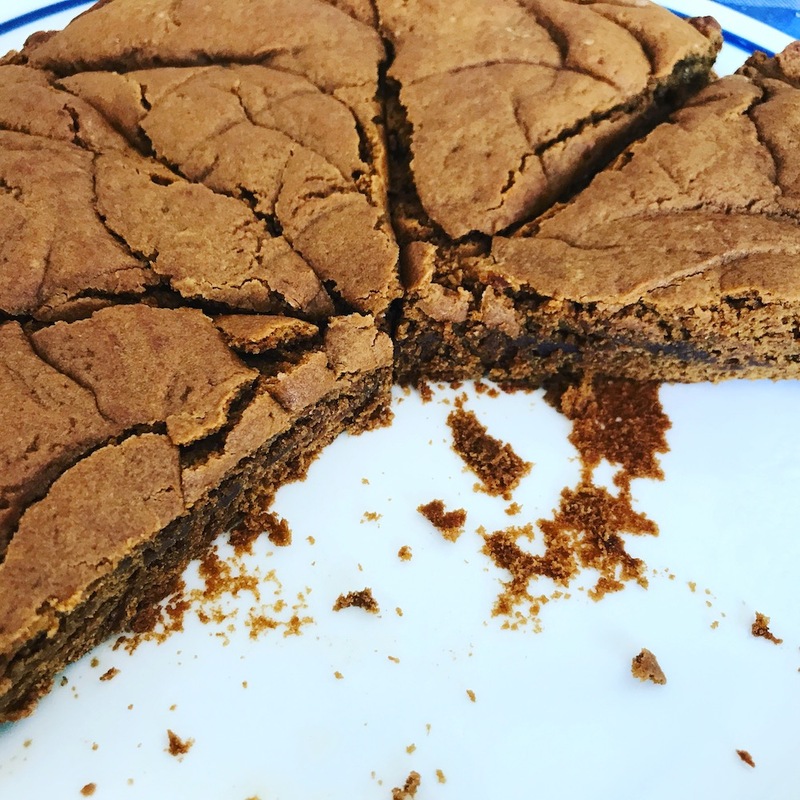 Gingerbread made from Emily Dickinson’s recipe. I would do this week all over again. It was an amazing experience, and should the NEH be spared and willing to offer this program again, I highly encourage you to apply. Thanks to Emily Dickinson Museum, Amherst College, and all the visiting faculty from whom I learned so much. 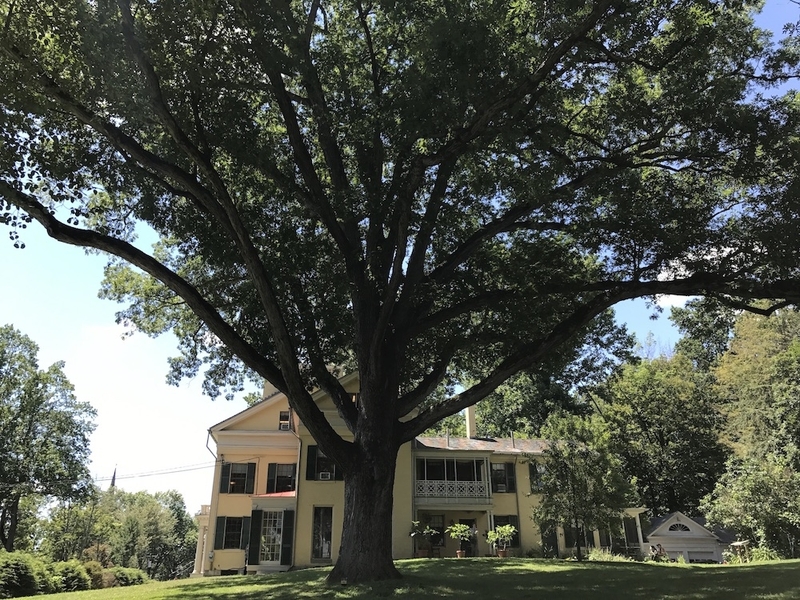 This post is the third in a series about my experiences at the NEH summer program, Emily Dickinson: Person, Poetry, and Place. If you haven’t read the first two, you can find them here and here. My experiences on the third day may differ slightly from those of other participants as we divided into groups. Once again, we started by “writing into the day,” considering “The Brain—is wider than the Sky” (Franklin 598) and the elements of Dickinson’s craft. Next, we a heard a lecture from Dickinson scholar Christanne Miller from the University at Buffalo. As I mentioned in my previous post, there have been three major editions of Dickinson’s poems since the 1950’s. Thomas H. Johnson’s was the first to make an attempt to date the poems chronologically and restore some of Dickinson’s intentions. Ralph W. Franklin’s Variorum edition has been widely influential in Dickinson scholarship. Christanne Miller has a new edition called Emily Dickinson’s Poems: As She Preserved Them. The organization of Miller’s book differs from Johnson’s and Franklin’s precisely as the subtitle describes. The first section of Miller’s book includes Dickinson’s fascicles; the second, Dickinson’s poems saved on unbound sheets joined together with a fastener (Dickinson may or may not have fastened the manuscripts); the third, loose manuscripts in Dickinson’s possession; the fourth, others’ transcriptions of her poems with no extant manuscripts; the fifth, poems given away to others. The concept is really interesting, and I really wish I had brought my copy of this book for Christanne Miller to sign. I considered packing it and decided not to in order to save space. I hope I run into her again so I might get it signed. It’s a beautiful book with images of manuscripts. Miller’s lecture was on “Editing Dickinson.” From everything I’ve learned in this workshop, editing Dickinson is difficult because of all the variants in her manuscripts, but we also have a large body of well-preserved work, and we can’t say that of every poet. One big takeaway from Miller’s lecture is that there is always more than one way to edit an author, and editors make decisions largely based on the tastes of the eras in which they are working. She said that no edition is neutral; each edition is a lens into the times in which it was created. As such, while our modern audience might see Mabel Loomis Todd and Thomas Wentworth Higginson as heavy-handed editors, changing slant rhymes and word choices, a case can be made that they knew their audience well and were editing the poems to suit their audience. Dickinson was ahead of her time. I can’t remember if Miller said it or if someone else did, but someone remarked that Amy Lowell believed Dickinson to be a “precursor of the Imagists.” In any case, Todd and Higginson’s editions of the poems were wildly popular, and we have much for which to thank them. Miller also argues that Dickinson may not have distinguished much between poetry and letters. Most tantalizing for me as a teacher was the fact that there is evidence Dickinson was instructed to select alternative word choices in her school compositions. I love to think of Emily Dickinson’s writing instruction in school. Another issue that Miller acknowledged is that Dickinson made many typographical errors, often over and over. For instance, I had noticed she almost always uses the contraction “it’s” when she clearly means the possessive “its.” In the manuscripts, the mistake is clear, and it’s not a word choice variant. Franklin retains these typographical and spelling errors in his edition of her poems. While Miller points out that spelling and punctuation were not rigidly fixed or standard in Dickinson’s time, I have always found the kinds of errors she makes interesting. Most interesting regarding punctuation was Miller’s comment about the ubiquitous dashes in Dickinson’s poetry. While Dickinson does use a lot of dashes, some of them may be commas and periods. If you examine the manuscripts, it is hard to tell whether or not the marks are dashes. We all do such things when we are writing, especially in our drafts. Here is an example of a manuscript I saw in which it’s hard to tell if we’re seeing dashes or something else. The mark after “several” could be a dash, or it could be a period. One last comment about Miller’s lecture and I’ll move on (we’re already at nearly 700 words!). Miller believes that Dickinson composed at least the beginnings of her poems largely in her head. The last stanzas often include more variant word choices (not that the beginning stanzas never do, but you see a lot in the last stanzas). Also, the last stanzas are sometimes the most problematic. I know as a reader, I have more difficulty understanding the last stanzas of her poems. Also important for teachers: Dickinson tries out a number of speakers and perspectives. We are usually so good about asking students to think of the speaker as separate from the poet, but I think we might be guilty of forgetting to do that with Dickinson’s poetry. One way to help students with her poetry is to ask them to read it aloud and to look for natural “sentences.” Don’t worry about the dashes and enjambment. Next, my group joined Martha Ackmann for a discussion of Dickinson’s poetry. She is delightful—funny, knowledgeable. She quoted Dickinson’s letters and poetry frequently, and without consulting notes. Ackmann suggests that we can look at many of Dickinson’s poems as Dickinson’s philosophy of poetry—ars poetica. We did a close reading of “I reckon—When I count at all—” (Franklin 533). Ackmann reminded us as teachers to slow down when we are reading and teaching Dickinson. She also reminded us that Dickinson’s schooling largely consisted of declaiming lessons and memorizing, and she had an encyclopedic knowledge of many texts, including the Bible. When Dickinson is ambiguous, she intends to be. Ackmann also said we must acknowledge the “primacy” of Dickinson’s imagination. We tend not to give her credit for being able to imagine experiences she never had or places she never went. My favorite quote from our discussion was Ackmann’s argument that “She lived in her own mind, and what a place to live.” Ackmann also argues that Dickinson didn’t care about publication, but she did want her poems to live on. She wanted to do more than publish; she wanted to be immortal, a subject discussed in many of her poems. After lunch, we took a self-guided landscape tour, which is something you can do yourself if you visit the Emily Dickinson Museum. You can even use your cell phone and either call into a number to follow the tour or use the QR code provided. They also have wands you can use to listen to the tour if you don’t have a cell phone or don’t want to use one. The tour was narrated mostly by poet Richard Wilbur. After the tour, we met with our curriculum groups to discuss how the essential questions and key understandings for our lessons or units were shaping up. We ended the day with a reading from Martha Ackmann, “Mary Lyon, Emily Dickinson, and Women’s Education.” Mary Lyon founded the Mount Holyoke Female Seminary, where Dickinson went to school at the age of 16. Ackmann is writing a book tentatively titled Vesuvius at Home about ten monumental days in Dickinson’s life. Ackmann is a narrative nonfiction writer, which means her books are all factual but use the techniques of storytelling. She fictionalizes nothing. She described how she writes each chapter, and the amount of work she puts in is incredible. She mentions enjoying Truman Capote’s In Cold Blood, especially praising the way he begins the book, but she dislikes the fact that he invented dialog. She will not read narrative nonfiction that doesn’t have footnotes. Her book should be out in 2018, and I will be getting it for sure after the chapter I heard, which was about Emily Dickinson’s decision to continue to question her religious beliefs. You can see this questioning over and over in the poems. Ackmann is a Senior Lecturer in Gender Studies at Mount Holyoke College, the institution that grew out of Mary Lyon’s school. I understand the Emily Dickinson Museum has plans to host an author event when Ackmann’s book is published, so keep your eyes on the news, and I will see you there. 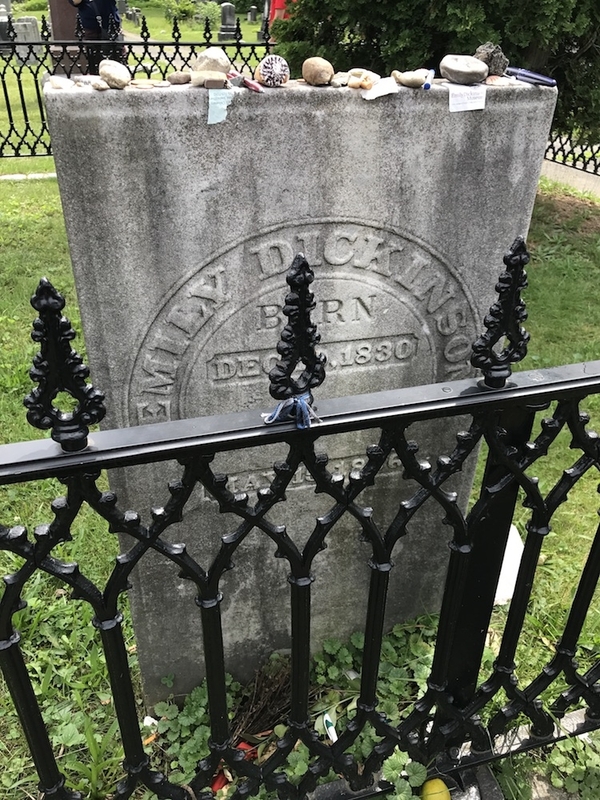 This post is the second in a series about my experiences at the NEH workshop Emily Dickinson: Person, Poetry, and Place last week. 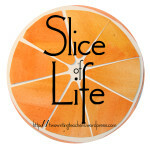 If you haven’t read the first post, you can access it here. We were invited to think about the poem through the lens of teaching, and I liked the prompt so much that I plan to use it in a department meeting early in the school year. Next, we divided into smaller groups, and though the sequence of events differed depending on the assigned group, all workshop participants had the opportunity to engage in the following experiences in some order. My group first went to Amherst College’s Frost Library to hear a lecture from Marta Werner, an Emily Dickinson scholar—”‘She does not know a route’: Reading Emily Dickinson’s Manuscripts.” Werner invited us to think of the manuscripts Emily Dickinson left behind almost like maps, where we can see a topography and travel from one continent to another, and even from one world to another. Werner noted that she believed Dickinson’s handwriting became more ungendered over time. Her earliest manuscripts are written in what Werner describes as a more feminine hand. There is certainly a lot to think about, but regardless of whether or not one agrees with this assessment (I can actually see it, having looked at some manuscripts both in person and online), I found it fascinating to learn that her handwriting changed so much over the course of her life that it is often through her handwriting that her manuscripts are dated. I feel I should stop and explain something you might not know anything about if you haven’t engaged in a study of Dickinson’s poetry. I mentioned in my post yesterday that the first real attempt to date Dickinson’s poetry and arrange it chronologically as well as restore, as much as anyone can, Dickinson’s intentions free from the heavy editorial hands of Mabel Loomis Todd and Thomas Wentworth Higginson, was a publication of her complete poems in the 1950’s by Thomas H. Johnson. There have been two more recent publications—Ralph W. Franklin’s Variorum Edition of the poems in three volumes, which is an attempt to show all the extant manuscripts, including variants, and also variant word choices Dickinson considered on single manuscripts. There is a reader’s edition of this same work, which was our main text for the workshop, and therefore why I refer to her poems by their Franklin numbers. Franklin set out to date the poems as accurately as possible and differs from Johnson somewhat. I mentioned there have been two more recent comprehensive editions of Dickinson’s poetry since Johnson’s, but I will save discussion of the second for a future post, as later in the week I had an opportunity to study Dickinson’s poetry with the editor of that third collection. 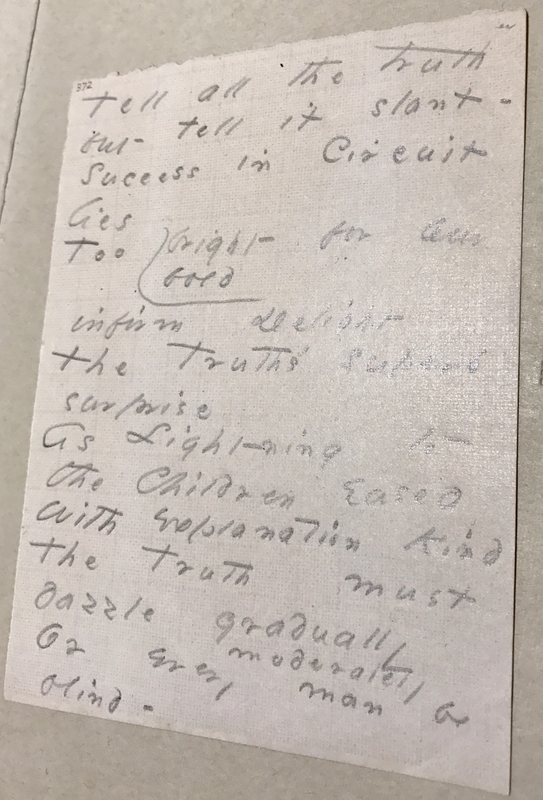 Dickinson left behind a variety of manuscripts in many stages of development. Some were mere scraps with ideas. Dickinson also has drafts that seem to be in a clearly unfinished state. She has fair copies and also gift copies sent to friends and family. Just because a manuscript is copied out in a fair copy or gift copy, however, does not mean that it was a final draft. Dickinson often continued to change words and lines even after making fair copies and gift copies. 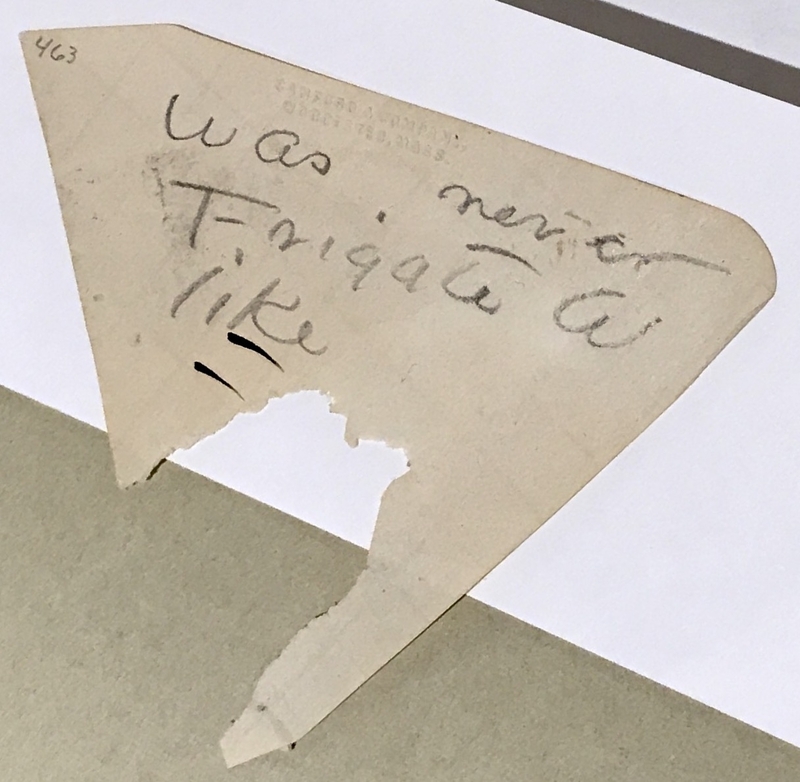 In addition, there are also intermediate copies that Werner describes as “worksheet manuscripts” that show the continued consideration Dickinson was giving to a poem. Some of you may know that Dickinson bound some of her poems together in what Mabel Loomis Todd first described as “fascicles.” These were manuscripts sewn together with a needle and thread. Again, just because the poems were bound in fascicles does not mean Dickinson considered them final drafts. Dickinson was comfortable with a great deal more ambiguity and a lot less fixity than most of us. As such, we can’t really talk about her intentions with any sort of authority in some cases. We spent the remainder of our time with Werner discussing some poem variants. If you really want to go down a rabbit hole, looking at Emily Dickinson’s drafts is both interesting and maddening. You can examine many of her manuscripts online. After Werner’s lecture, my group headed downstairs to the Frost Library’s archives. This was a real treat. 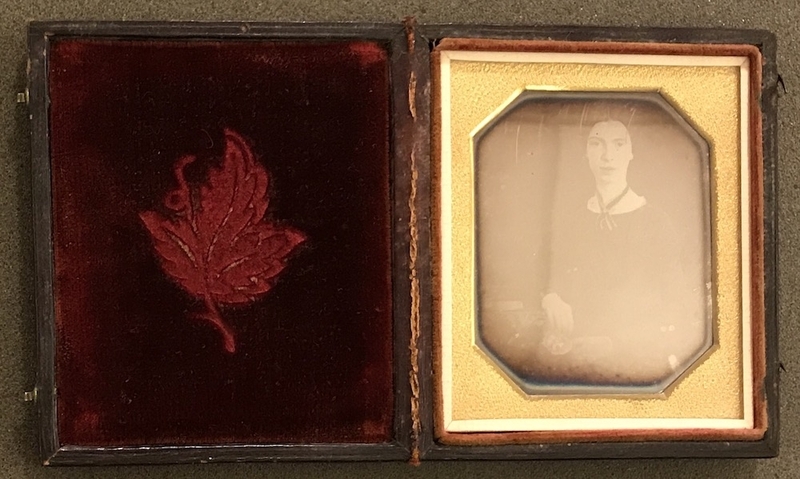 We were able to examine several artifacts connected with Emily Dickinson, including the famous daguerreotype that is the only definitively authenticated picture of Emily Dickinson. It was very hard to photograph in the lighting. 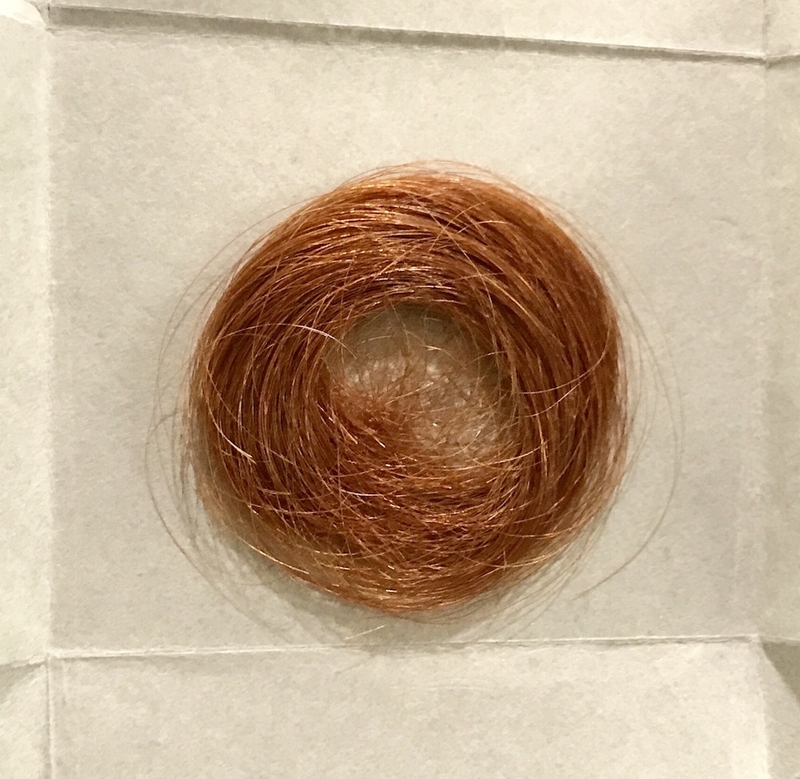 We also were able to see a lock of Emily Dickinson’s hair. The color may surprise you. 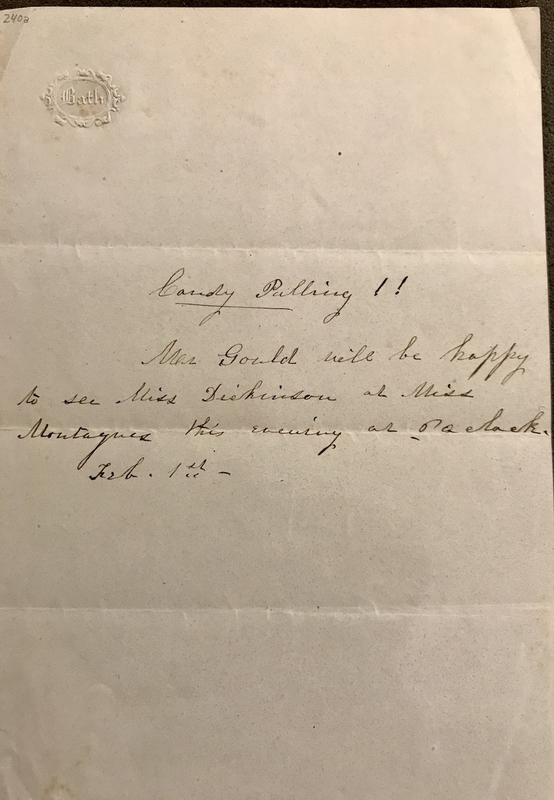 In addition, there were also some daguerreotypes of Emily Dickinson’s brother Austin and George Gould, who may have been an early suitor of Dickinson’s and sent her this invitation to a candy pulling. On the back of this invitation, some 25 years after receiving the invitation, Dickinson wrote the poem “I suppose the time will come” (Franklin 1389). She saved the invitation all that time, and it’s tantalizing to think she was inspired by it when she wrote the poem and to wonder what she was thinking. Was she regretful about not taking him up on it? Or was she just making use of a scrap of paper she saved out of a sense of Yankee frugality? We saw so many manuscripts that I will not share them all here, but I will share one last one that you will recognize. I promise I’m not trying to be cute by sharing a slanted photo of the poem. There was a bad glare from the lights, as you can see, and I was attempting to take a picture in a way that would not cast a shadow on it and also reduce the glare. As you may have already surmised, we were not allowed to touch any of the artifacts. I don’t know if you can see it well enough in this image, but she actually wrote this poem on graph paper. Who has a sense of humor? After lunch, we returned to the Emily Dickinson homestead for an object workshop. My small group headed over to the Evergreens, the home of Emily Dickinson’s brother Austin and his wife Susan Gilbert Dickinson. Nan Wolverton of the American Antiquarian Society (here in Worcester!) allowed us to examine two objects. I partnered with my friend Whitney, and we were given a small hearth broom and wastepaper basket to examine. We learned that the objects were both made by Native Americans. The broom was probably bought from a Native American peddler who traveled door-to-door selling wares, and Dickinson describes such events in her writing. The wastepaper basket was of a Penobscot design and probably bought as a souvenir when the family vacationed in Maine. It’s weird to think that people have always bought such things when they travel as mementos. I asked Fred Venne how on earth she could have known the Holyoke Range was formed through plate tectonics and vulcanism—it seemed like such advanced science for the time, and he told me it was because Edward Hitchcock was so advanced. He was the first to surmise that the footprints he was finding, the dinosaur tracks, were left behind by a large bird. It would be a very long time before paleontologists began thinking of dinosaurs as early birds. It was absolutely fascinating, and if you can visit the Beneski and talk to Fred Venne, you should. In the meantime, you can check out the museum’s new website. If you go to Special Features and look under “Voices,” you’ll see Emily Dickinson referenced. I will write more about the rest of the workshop in future posts, but I hope at this point I’ve convinced you of a few things: 1) write to your representatives and senators about preserving the NEH; 2) if this workshop can continue because the NEH continues, please apply to be a part of it; it’s amazing, and 3) Emily Dickinson is a bottomless well, and one could devote a lifetime to scholarship of Dickinson and her world and always learn new things. 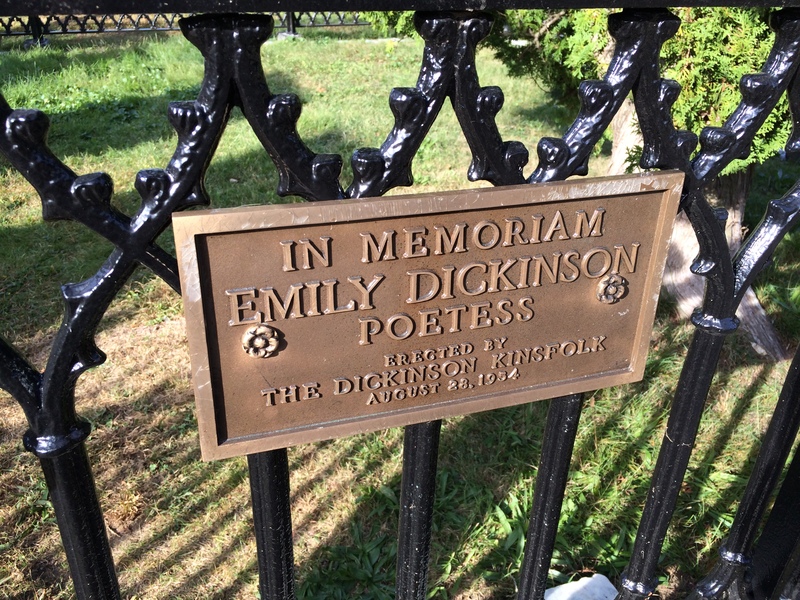 This week, I had the great fortune of participating in an NEH workshop in Amherst, MA at the Emily Dickinson Homestead and Amherst College—Emily Dickinson: Person, Poetry, and Place. The experience was so meaningful and rich that I know I won’t be able to capture it in one post, but I will try to do it justice in several posts. I plan to write one post about each day of the workshop. It was not my first visit to Amherst or the Emily Dickinson Museum, but it was the most meaningful and personal. The first evening, we gathered together for dinner and conversation. I was delighted to be able to reconnect with Whitney, whom I met at the Kenyon Writing Workshop for Teachers, and also to make new acquaintances (and by the end of the week, I called them friends). Early the next morning, we met at Amherst College. A new friend and Massachusetts teacher Bruce Penniman, whom I first met through the New England Association of Teachers of English and the Western Massachusetts Writing Project, led us each morning in contemplation of an Emily Dickinson poem and a writing prompt. “Writing Into the Day” soon became one of our favorite activities, and it’s a great way to start the day with your own students. If I read a book and it makes my whole body so cold no fire can warm me I know that is poetry. If I feel physically as if the top of my head were taken off, I know that is poetry. These are the only way I know it. Is there any other way? I recall feeling one of Emily Dickinson’s poems read me when I discovered it after my grandmother died last year. The lecture opened me up to new ways of thinking about why Dickinson didn’t publish. Friends urged her to do so. In her way, she did publish—manuscript circulation or social circulation was common in her day. She actually made no provision for her manuscripts upon her death. Her sister Lavinia burned her correspondence, which was customary in the era, but saw to it that her sister’s poetry was collected, edited, and published some four years after Emily Dickinson’s death. Lack of publication allowed her to be incomplete, to defy closure. People are uncomfortable with a lack of closure. Her poems can be uncomfortable, particularly as many of them contain varietals, and we do not know what her final word choices might have been. After this lecture, we walked over to the Emily Dickinson Museum and toured both the house and the Evergreens, home of Austin and Susan Gilbert Dickinson, next door. If you are in Amherst and can take in this tour, you definitely should. The tour guides are knowledgeable. I have toured the home three times and the Evergreens twice, and each time has been a great experience. In the afternoon, we learned about expectations for creating our curriculum projects, which I was happy to see were grounded in backward design. I’m still working on my unit plan, but I feel really good about it in the draft stage, and I believe it will be a great learning experience for my students. I’m considering trying to find a way to bring my students to the Dickinson museum. Our final lecture of the day was “What Happened to Emily Dickinson’s Stuff,” delivered by Jane Wald, who is the Executive Director of the Emily Dickinson Museum. The history of the publication of her work is a fascinating family drama. Initially, Emily Dickinson’s sister Lavinia asked their sister-in-law Susan Gilbert Dickinson and Dickinson’s friend and correspondent Thomas Wentworth Higginson to publish Dickinson’s poetry. Susan Dickinson seemed disinclined to move forward with the project in any productive way, and Higginson said he couldn’t undertake the editing at that time. Lavinia turned to Mabel Loomis Todd, who was a writer, a correspondent of Emily Dickinson’s, and most infamously, their brother Austin Dickinson’s mistress. She persuaded Thomas Wentworth Higginson to help her edit Dickinson’s poetry, and together they produced the first published (and heavily edited) volume of Dickinson’s poetry by 1890. They were so popular that two more volumes of poetry and a collection of Dickinson’s letters were published in the 1890’s. Later, Lavinia had a falling out with Mabel Loomis Todd over a property dispute, and Lavinia filed a lawsuit against Mabel. Todd lost the lawsuit, so she locked away the Emily Dickinson manuscripts in her possession in a camphorated trunk, and no one touched them for thirty years. Dickinson’s niece Martha Dickinson Bianchi was the next person to publish a volume of Emily Dickinson’s poetry, but because of the family squabbles between the Dickinsons and the Todds, it wasn’t until the 1950’s when Thomas H. Johnson returned to the manuscripts and made the first attempt to establish a chronology for the poems. The history of Dickinson’s publication (as well as her own feelings about publication) is fascinating, but I’ll save more for future posts. It was raining buckets, so our walking tour of Amherst was converted into a virtual tour. The delightful Martha Ackmann, a Dickinson author and scholar (you’ll hear more about her in future posts) used maps and visuals to take us to Emily Dickinson’s Amherst. We considered the landscape and the soundscape. I knew from being in the Emily Dickinson homestead that Dickinson could hear the train from her bedroom. I discovered on my last day of the workshop that Emily would have been able to see the train as well. As you can see (I’ve written over 1,000 words already), our days were full—too full to recount in a single post. A new poem I learned of (one of many) in this workshop seems appropriate to share to close, given what we learned about Dickinson and publication on this first day. For some reason, Emily Dickinson’s line, “There is no Frigate like a Book / To take us Lands away” is running through my mind after re-reading Michael Cunningham’s novel The Hours. My AP Lit students read and studied Mrs. Dalloway before spring break, and I asked them to read Cunningham’s book over the break. Since it had been quite some time since I read it, a re-read was in order for me, too. I remember it didn’t quite land for me when I first read it. I recognized it was well written, but I couldn’t have foreseen I’d read it again. Because I really love the idea of intertextuality, and also because I borrowed my AP book list largely from a friend and colleague, I decided I’d do Mrs. Dalloway and The Hours together. 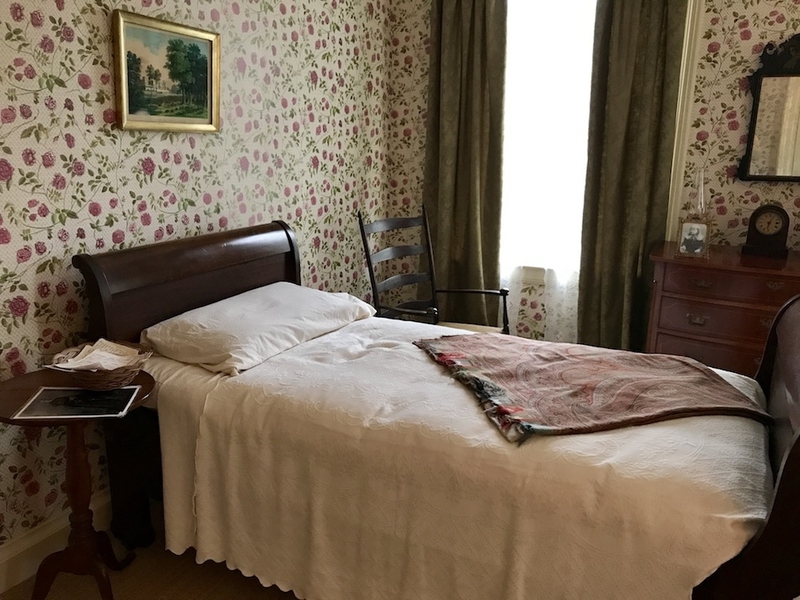 My students empathized with Septimus Warren Smith, and they really wanted to talk about him in our discussions, though they also marveled at Virginia Woolf’s writing and tried to connect to Mrs. Dalloway as a character, too. I think they did good work. I will be curious to see how they appreciated The Hours after having read Mrs. Dalloway first, because my first reading of The Hours was years before my first reading of Mrs. Dalloway, and I believe I appreciated The Hours more after understanding how it is in dialogue with Mrs. Dalloway. What I have really been thinking about today, however, is re-reading. I often tell students that we bring everything we are, everything we’ve read, and everything we’ve done to each book. 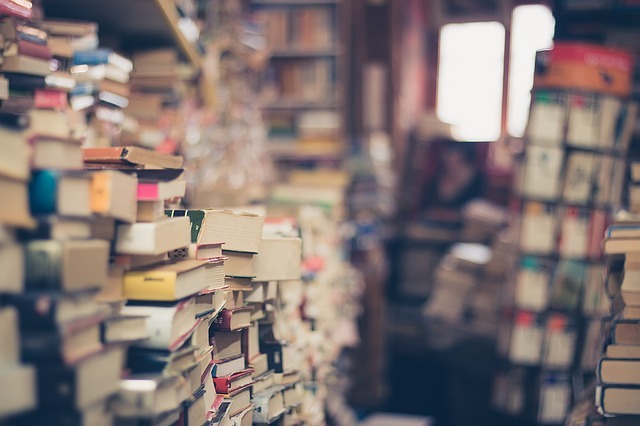 When we re-read with a gap of time, we often find we respond differently to a book the second time because we are not the same people we were the first time we’ve read, we’ve read more books, and we’ve lived more. In the case of The Hours, my response was entirely different. I connected deeply to the characters in a way I couldn’t when I first read the book 13 years ago. I remember having the same reaction to re-reading The Catcher in the Rye. I read it as a teenager and despised Holden. Who cares about some ungrateful, annoying preppie teenager roaming New York? How horrified I was when a high school friend once told me he thought all teenage boys were Holden Caulfield. Years later, I saw Holden entirely differently, but it took becoming a mother and a teacher for me to empathize with Holden. Now I love that book and count it among my favorites. While I know that there is a popular movement in English teaching today to throw out the whole-class novel study, I do still see value in it. I know for a fact that some of the books I am asking my students to read won’t land for them, not yet. I have told them so. And yet there is still value in reading and thinking about these books, letting them rattle around in our brains, and returning to them (if we want to) years later when perhaps we are ready for them to land. At the same time, I do think students need to learn what they like to read in order to become readers, and we should offer opportunities for students to choose what they read as well. The tricky part is not ruin a book so that students have no desire ever to return to it again. Of course, I never really know if students do return to books unless they make a point of telling me, and often they are living their lives, reading other books, and doing other things, so I never know for sure if they pick up a book we studied together, look at it again with their more experienced eyes, and connect to a book in a way they didn’t when they were in my class. But they do at least have the book, somewhere in their minds, and later, perhaps the book might just take them lands away. 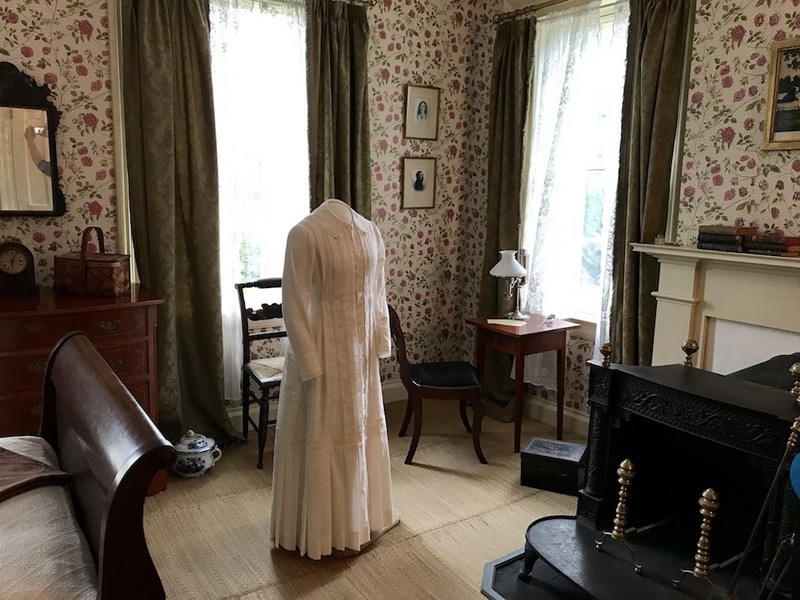 Last weekend, I presented at a digital storytelling conference in the Northampton/Amherst area, so I took the opportunity to visit Emily Dickinson’s house, now a museum. Photographs are not allowed inside the house, so I can’t give you a tour, but I would really encourage you to visit if you find yourself in western Massachusetts. 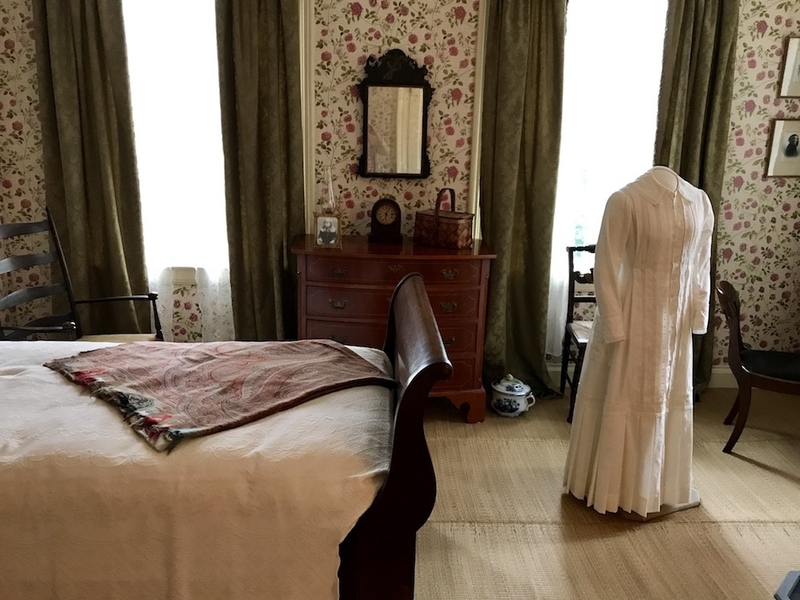 I took a docent-led tour of Dickinson’s house, but you can also take a longer tour that includes her brother’s home next door as well. My favorite part of the tour was upstairs. 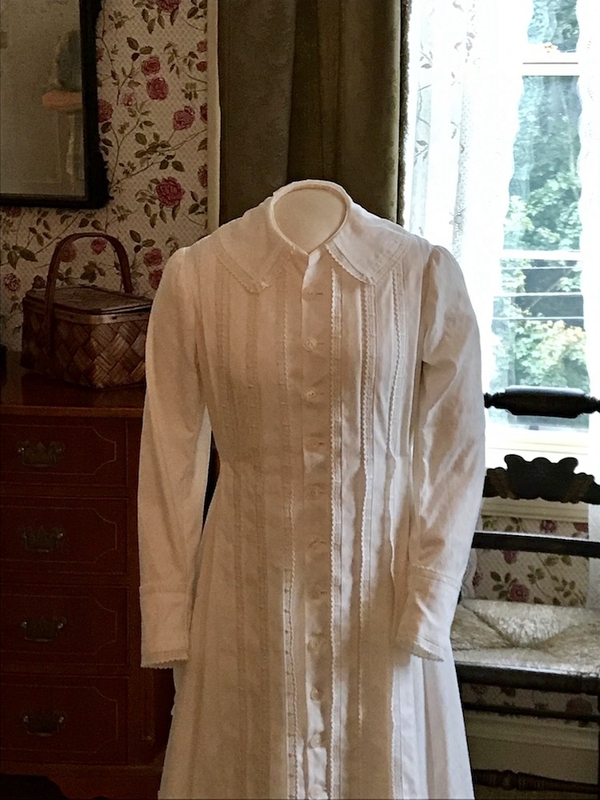 On the stairs’ landing is a replica of Emily Dickinson’s dress. The light shines through the window just right, and it looks almost ethereal. In Dickinson’s bedroom, the docent told us that the room had recently been renovated to include several items that were not previously there and new wallpaper that is a reproduction of the actual paper Dickinson had in the room. Her own sleigh bed is there. I was fascinated to learn Dickinson had pictures of George Eliot and Elizabeth Barrett Browning hanging in her room. Whether those pictures currently hanging in the room are the same ones or not, I don’t know, but Dickinson’s niece attested to the fact that she had pictures of these two women writers hanging in her room. Across from Dickinson’s bedroom is an empty room with two poetry installations. One examines many ways in which Dickinson’s poetry stands apart from other poetry—slant rhyme, ballad meter, and diction. The other examines a poem with alternative word choices. The poem is Fr 1469 “A Chilly Peace infests the Grass.” (Fr is the R. W. Franklin number for the poem, and along with Johnson’s edition, is considered a restored, authoritative edition.) In the installation, there are sliders installed so that you can examine the alternative word choices Dickinson was thinking of for some of the words. For “Chilly,” she also considered “lonesome—” and “warning—.” I kind of like the effect of “warning—” myself. 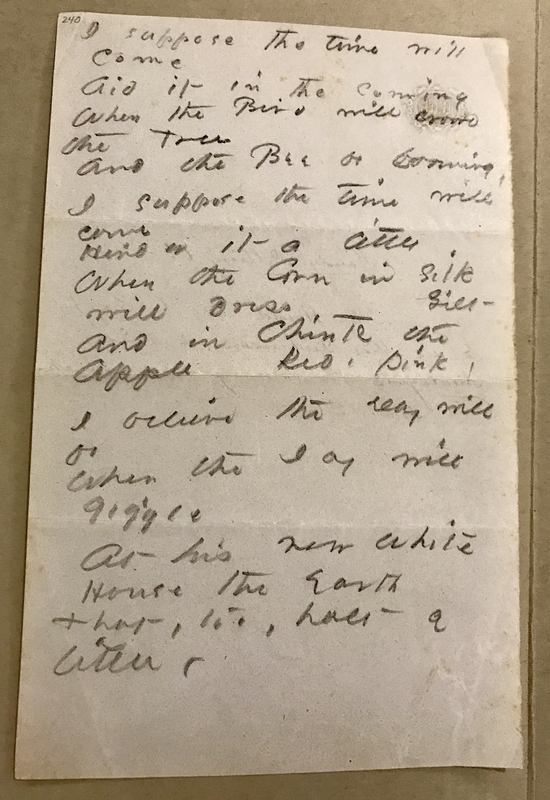 There is no final copy of this poem, and it wasn’t published (as many were not), so we don’t know what Dickinson ultimately decided for the poem. Of course, it gave me a great idea for a lesson. I was extremely sad not to be able to take pictures in the museum at that moment, but in speaking with the docent, and taking notes, I did walk away with a good lesson plan, and I was later able to find enough information online to create a good lesson plan. Caveat: The Franklin edition poems are copyrighted, as are the Johnson editions, so I can’t post what I created, but the limited preview edition of the three-volume Variorum Edition edited by Franklin does include this poem. Be mindful of the copyright. It is probably fair use to use it in your classroom, but it wouldn’t be fair use to distribute the poem online, I don’t think. Anyway, I re-created the diction variations for this poem using Smart Notebook software so students can interact with the different word choices like I could when I visited the museum. Later, I found this lesson by Cynthia Storrs on the museum website that is extremely similar to my own idea (only much more fleshed out in that Storrs considers other poems as well). After reading Storrs’s lesson, I added the poem Fr 124 “Safe in their Alabaster Chambers—,” which Dickinson appears to have edited extensively. It’s been suggested that she was never really quite happy with it. You can read two substantially different versions on Poets.org’s site. Incidentally, this poem is one of the few published in Dickinson’s lifetime, and she still continued to edit it after publication, so even publication cannot be considered the final word on word choice. I also added Fr 598 “The Brain—is wider than the Sky—” as an introductory piece in the lesson, as it had only two alternative word choices. I had forgotten how much I loved that poem. I hadn’t read it in many years. I don’t believe I’ll execute my lesson in exactly the same way as Storrs has written it. I plan to begin by asking students to journal about the question “How much does word choice really matter?” I did rather like Storrs’s essential questions, so I will borrow those. After a review of what “diction” is, I plan to display Fr 598 and allow students to examine the effect of the two alternate word choices. What is the effect? Which do they like better and why? Next will be the interactive version of Fr 1469. Students will be able to manipulate the word choices. I emailed our math chair to help me with the math, and he walked me through the reasoning (it’s been a long time since I did this). Considering all the word choices Emily Dickinson considered for this poem, there are potentially 120 different versions of that poem. Finally, I will have students examine Fr 124 in some detail, and perhaps with a partner or small group, much as Storrs describes in her lesson. Prior to this lesson, I will ask students to write poetry of their own (this part is not fully formed in my head yet). They will think about alternative word choices in their own poems and workshop the poems with these alternate word choices. I wish I’d been able to be in Amherst this weekend, as it was a Poetry Festival. I was definitely inspired by my visit. 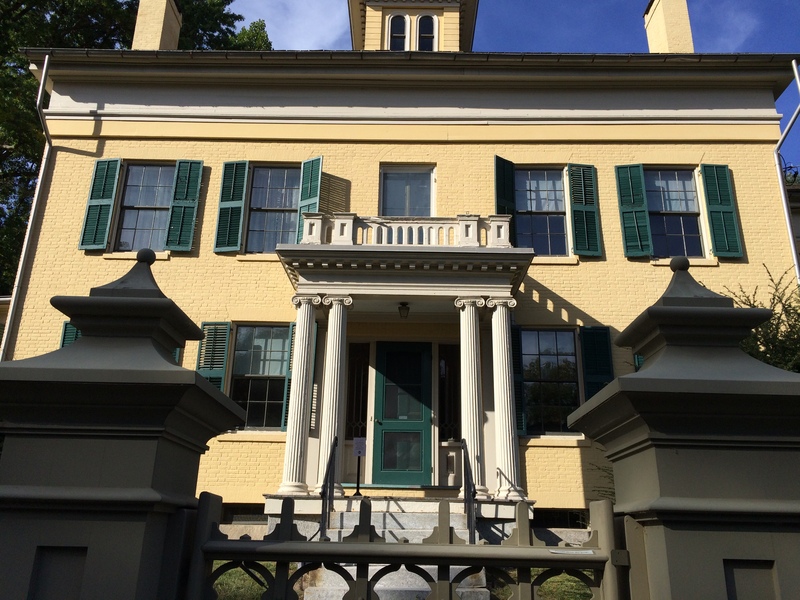 I’m lucky to live in what is essentially the cradle of American literature, and visiting Dickinson’s house made me realize there are probably similar lesson ideas an opportunities waiting out there for every other New England writer I could think of. I have some work to do. I ran right out and bought the R. W. Franklin edition of The Poems of Emily Dickinson and White Heat: The Friendship of Emily Dickinson and Thomas Wentworth Higginson by Brenda Wineapple. A few more pictures before I go. This gorgeous flower was in Dickinson’s garden. 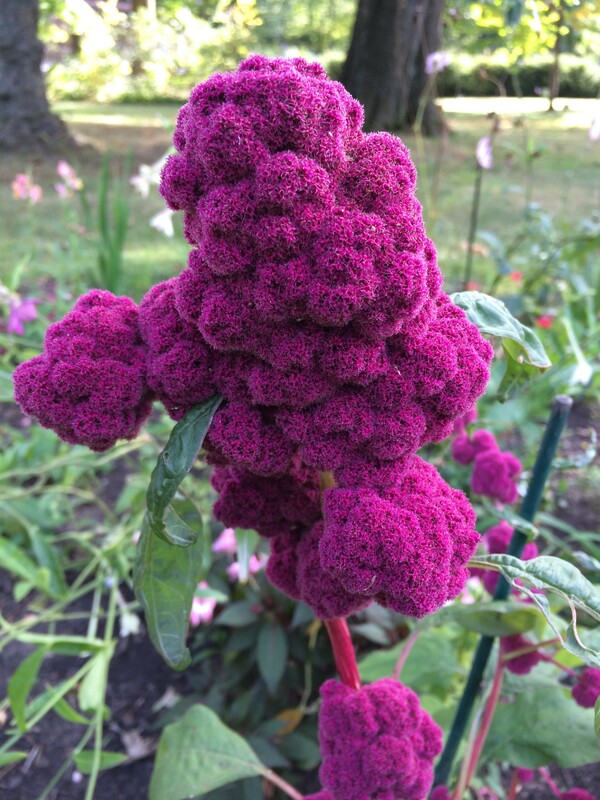 The label says, “Love Lies Bleeding” (Amaranthus caudatus). I immediately thought of Shug saying that it pisses God off if you walk by the color purple and don’t notice it. Emily Dickinson’s grave is only a short walk from her house, so of course, I had to stop by and pay my respects. I placed one of those stones there. I had to wonder how often the caretakers remove these items. 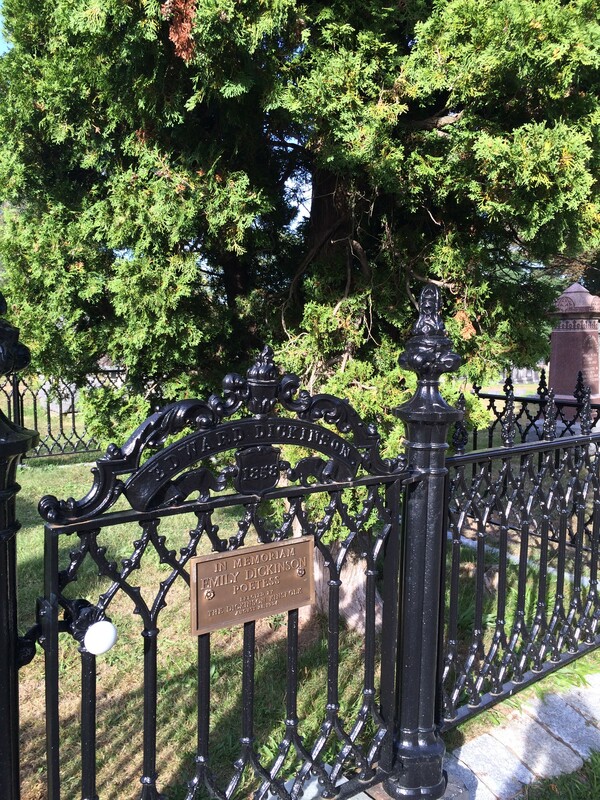 The Dickinson family plot is surrounded by a wrought iron fence. This plaque is on the gate. There is a tree growing in the plot. I am no botanist for sure, but I suspect it’s a yew tree. Can anyone confirm?